Sediba is a co-operative set up by the Anglo Platinum Group to train and give local jewellery makers, from South African platinum mining areas, much needed exposure in the South African market, and to uplift the communities in which they live under a unified brand. 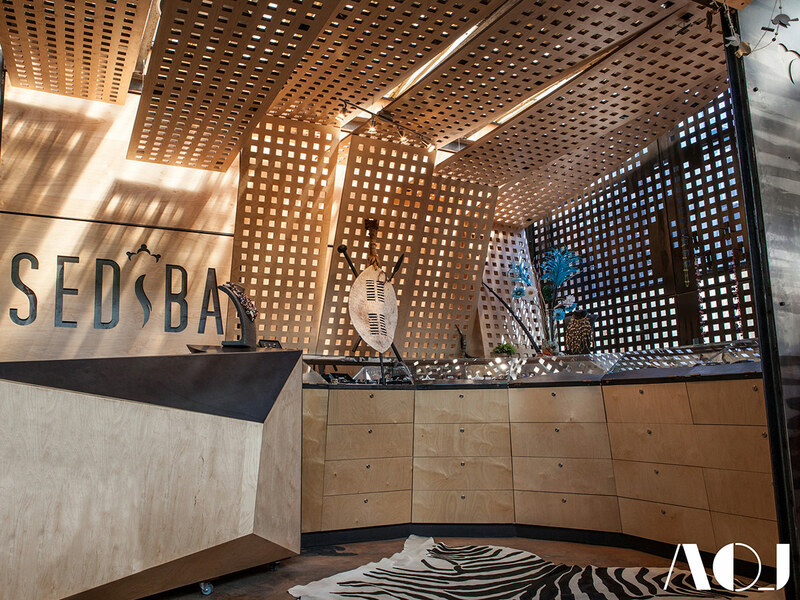 AOJ was commissioned to design the architectural language for the Sediba brand, and their first store, located in the old Rosebank African Craft market in Johannesburg. 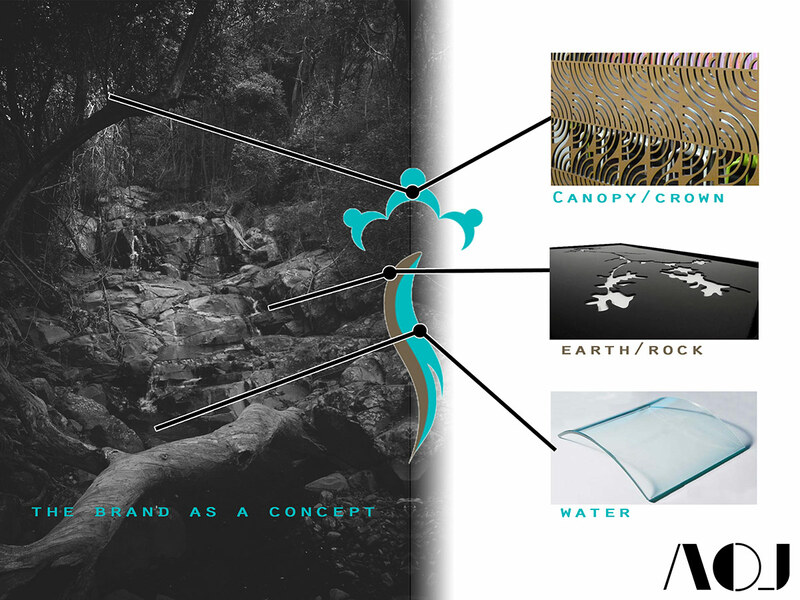 The project team started by unpacking the meaning behind the Sediba name and logo, and translating the essence of these into a form and an aesthetic, the resulting concept being a physical interpretation of the brand. Sediba is Setswana for fountain or spring. The logo represents this as a gently meandering river and river bank, topped with a crown, symbolic of the platinum mining community, and also the most obvious reference to a man crafted piece of jewellery. 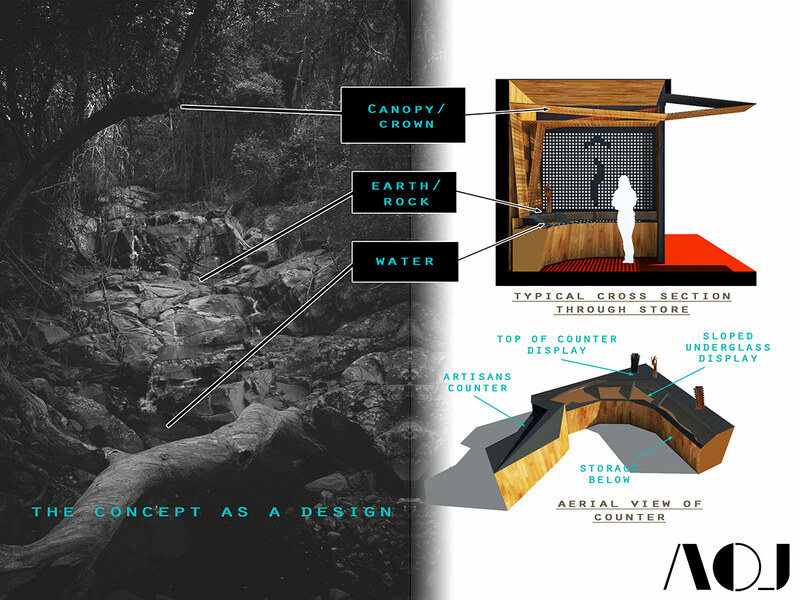 The shopfit components in the store, constructed from glass and raw mild steel, have a literal reference to the naturally flowing water of the river and the river bank through the way they are shaped and the materials they are made from, glass being the river and steel being the river bank. 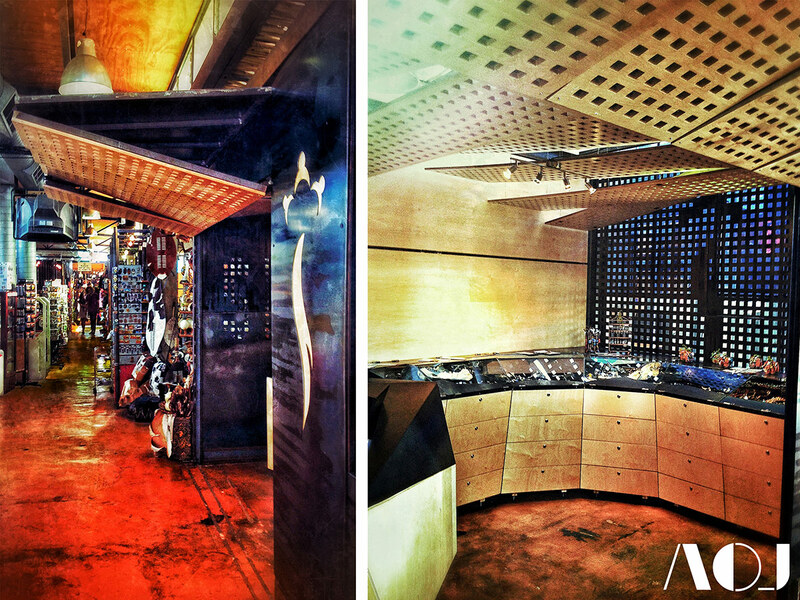 The interior walls and ceiling of the store, made from perforated routed timber panels, represent the crown of the logo, and create dappled light adorning the store with a jewel like shimmer. 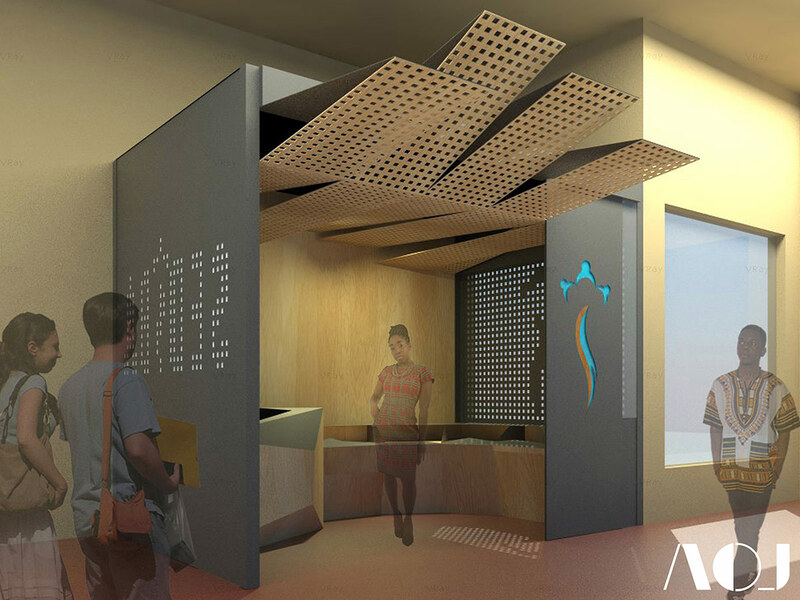 These panels extend into the passageway of the market when the doors are open, improving the visibility of the store. 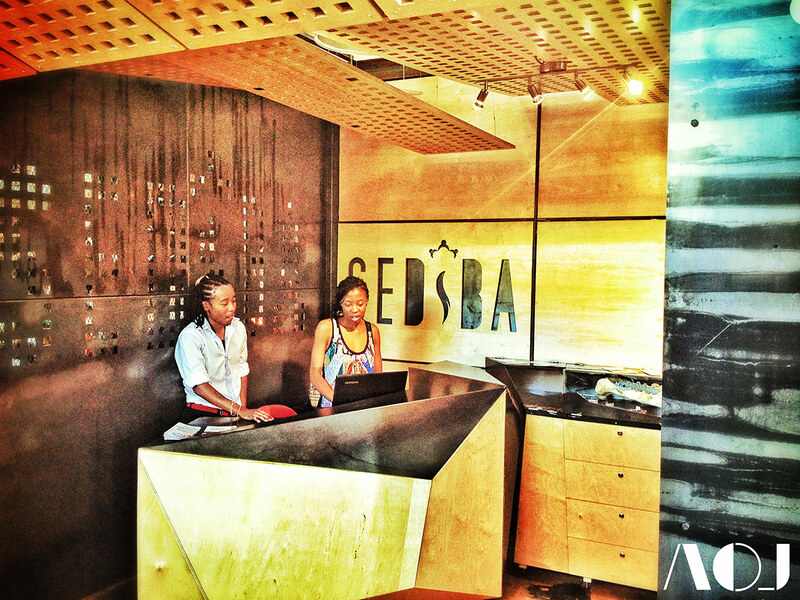 Inside the store the counter begins with a mobile jewellery station to the left, placed so that customers can watch Sediba jewellers, who work in the shop on a rotational basis, ply their trade; the counter continues into a display unit, meandering to the other end of the space. Additional stock is safely tucked away in the drawers beneath. The sales person in the store is made to be on the same side as the customer, maximising much needed display space, and allowing for one on one interaction with potential buyers. The shopfitting and store were designed as a prefabricated kit of parts, which could be erected and fitted with relative ease, and relocated to another site if required, as the old Rosebank Craft Market was already earmarked for demolition and relocation approximately one year from the store being opened. 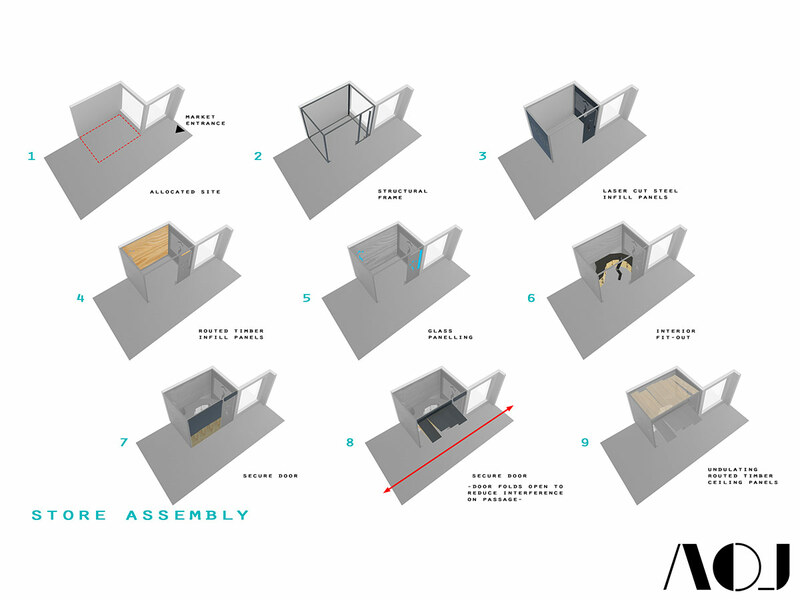 The precisely prefabricated components, made by means of laser cutting and routering techniques, create a purposeful balanced tension between the unique handcrafted jewellery that the store sells and the “jewellery box” that is the store that contains them.